May We Be Better Together: You and Me at the J!! Sol is conked out, so I have a minute to eat, post, and then off to study! This child is exhausted! We've had a great couple days doing activities available at the LJCC! Okay, let me start off by saying, seriously? Do you see these rates!? How could I pass up the opportunity to do something fun with Sol at such a low cost! 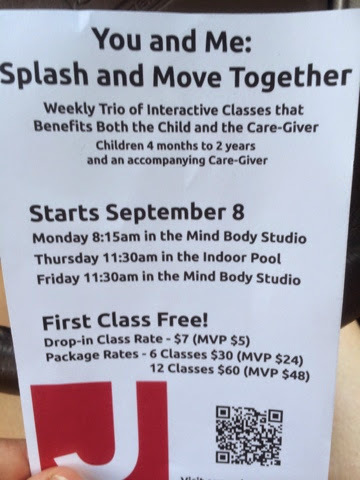 I'm definitely buying the 12 classes and will probably go to the splash class every week and to the play class as often as I can. Before you continue reading, go back to that picture. Do you see the classes are available to nonmembers? And at only five dollars a class! I love it. I really hope anyone (um, unless you don't have a child with you) feels welcome and will join us! Yesterday was our first class and Sol wasn't so sure about what we were about to do. There were other little ones in the pool taking private swim classes. Not all of them were so happy. But for Sol, it was comforting to have mommy! 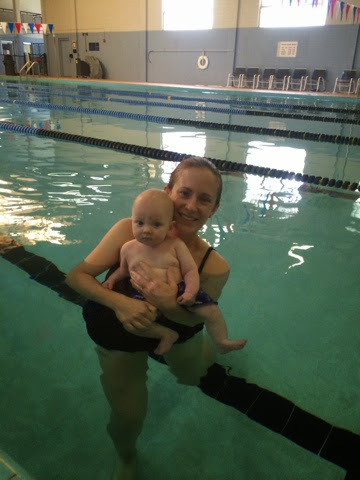 Honestly, he is still so little that there's not much he would get out of private swim lessons that he didn't get from our class yesterday. And for me it's only $4! David and I have both been very interested in getting Sol acclimated to the water as soon as possible. 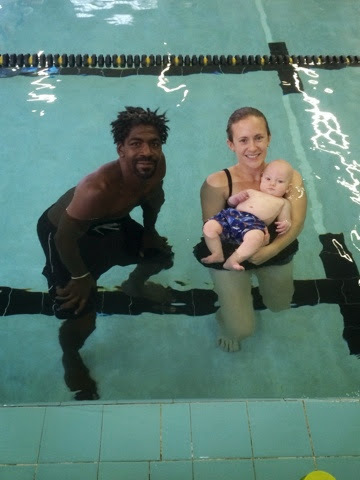 If we hadn't had this option, we would have signed him up for private swim lessons...or would we have? They're kinda pricey!! Um, hello! 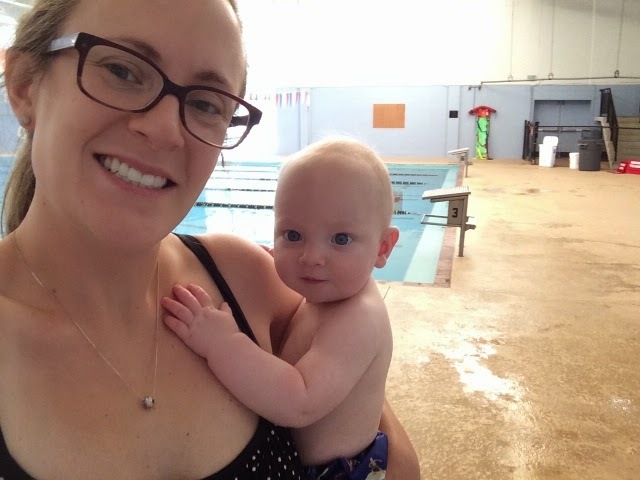 We had a private swim lesson yesterday! Where is everybody? We felt pretty spoiled, but we would rather have some friends there with us! Muhammad (or Mo) was great. He introduced us to going underwater, kicking our feet while laying on our back, floating, and swimming with the noodle. Of course, I had my hands on Sol at all times and was able to comfort him when I felt appropriate. I know how swim lessons go. Parent drops off child. Child gets in water with swim coach a.k.a. stranger. Child screams! Water and who is this person? I am definitely not saying it is wrong to take your child to swim lessons with a private lesson. We will do it eventually! I love that the J is offering this class so that Sol can get comfortable in the water before he is ready for serious swim lessons. May I introduce you to Megan, Laura, and Rob! I'm sure you all recognize Sol. Megan and Laura will be teaching the play classes on Monday and Friday. I'm so excited our friends Karli and Landon came! Landon is a couple months younger than Sol, and Karli and I have been threatening to have a play date for too long. The class did start with singing and dancing! We new mommies are still learning some of the words, but this class will help! We worked our arms, legs, and core. They incorporated a little bit of body flow and core barre too! I got a great workout and was able to spend time with Sol! I'm looking forward to our next class! If anyone is interested in joining this class, your first time is free! You can register for a spot online. Also, it's called You and Me not Mommy and Me. Anyone should feel welcome: daddy, bubbe, grandma, nana, zayde, grandpa, lito, caregiver, aunt, uncle, friend...come on! Hope to see you in class!